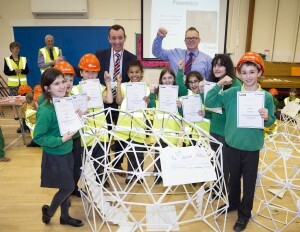 BROOKWOOD Primary School pupils rose to the challenge of a very special building project recently. The junior designers at the Connaught Road school were set the task of designing and building their own mega structures, with a little bit of expert guidance from the professionals at regional construction company Beard. The grandiosely-named Mega Structure Construction Challenge was organised by Guildford-based education charity SATRO – and sponsored by Beard. A day of developing science, technology, engineering and maths (STEM) skills was on the timetable for Brookwood’s eight to 10-year-olds. Working with industry professionals in a hands-on project experience, the initiative aims to provide youngsters with a fun, yet realistic, experience of working in STEM-related jobs and encourage more young people into STEM careers. Beard Guildford Director Guy Hannell explained the project: “The children were divided into eight teams and then set the task of designing and building a stadium using a rolled-up piece of A4 paper. Awards were presented for the best team presentation on how the structure would be used and the role of each team member in its construction and delivery. Beard will be teaming up with SATRO for another Mega Structures Challenge at Pirbright Village Primary School in March.